Since all the Honeys of The Homestead Honey hour believe it’s important to formulate shows based on what our subscribers and listeners want, Katzcradul is devoting this upcoming show to the discussion of “Smarter Food Storage”, how to get the most: for your food storage dollar, from the places where you store your food, and from your time, efforts, and abilities. 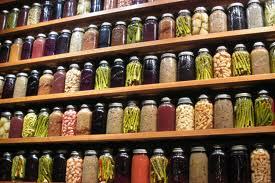 Join us as we learn from each other, sharing our best ideas for managing our food storage. Listen to this broadcast or download “Smart Food Storage!” in player below! The women of ‘The Homestead Honey Hour’ have many things in common. What initially drew them together was they each had a YouTube channel, where they discussed homesteading, preparedness, and self-sufficiency. They have partnered on Prepper Broadcasting Network because they see an opportunity to share their skills and abilities with many, like themselves, who are preparing for whatever the future brings. Current situations, both social, economical and geo-political, require a ‘no-nonsense approach’ to preparedness. These four ‘Homestead Honeys‘, Noreen, MichiganSnowPony, and Katzcradul say “Bring it on!“, and are willing to lay down their, rolling pins, shovels, and canning jars, long enough to pass along sound information and answer some questions! So pull up a chair to their online kitchen table, pour yourself a glass of lemonade, and join the fun! Previous: Previous post: To bray and to act no different! Next: Next post: Solar on a Budget!